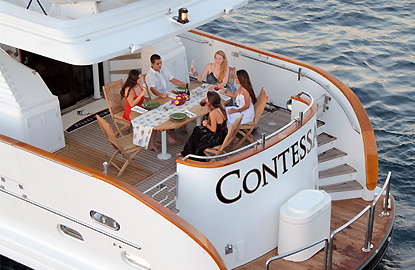 Built in 2000, the Contessa had a full refit in 2014, with a completely new interior. 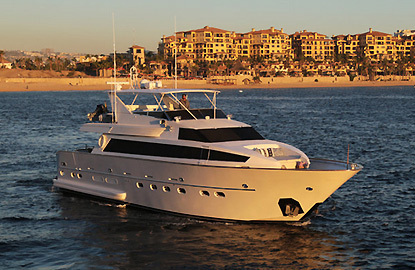 Contessa is the perfect Cabo charter yacht with plenty of space and comfort. Double stairs lead from the swim platform up to the ample aft deck which is perfect for outside dining. The salon has a large open plan, affording plenty of seating for family and friends. Two crescent shaped sofas face each other in fine white leather which offset the impressive cherry wood interior and brand new carpet, which feels like walking on a cloud. Beyond the living area is a U shaped dinette across from the formal dining area for six. The galley is well outfitted with stainless steel appliances, two convection ovens, dish-washer & two freezers. Forward on the lower deck are three staterooms all with their own bathrooms. The master is full beam and has a queen bed. The two forward staterooms have twin beds. The VIP is situated aft and is also full beam with a queen bed. There is a comfortable sunbathing area on the bow. The large upper deck has plenty of shade and is accessed by twin curved stairs from the aft deck � this is the place where people naturally migrate to as it affords a nice breeze and place to congregate. The vessel has a dinghy, stand up paddle board, snorkel gear and two kayaks. A portable live bait well allows for light fishing when requested. Underwater lights with a range of colors create the ambience of your choice. Contessa is extremely sea worthy and stable, due to her beam, large stabilizers and powerful bow thruster. 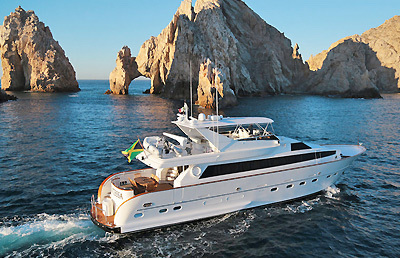 This is the ideal vessel for day trips and she is absolutely perfect for overnight and week trips on the Sea of Cortez. Captain Adam Reckert is from Florida originally and lives for the ocean. He is extremely pleasant and is also a highly experienced fisherman. Deckhand Jose is a Cabo native dedicated hard working; he prides himself on an impeccable vessel. Jose has 20 years� experience on the Sea of Cortez and loves all watersport activities, but especially skim-boarding and surfing. He is also an excellent fisherman & pretty good cook too when called upon. 11.5 foot Dinghy. 30 HP.